Ted Mahsun: REVIEW: Travels by Michael Crichton. 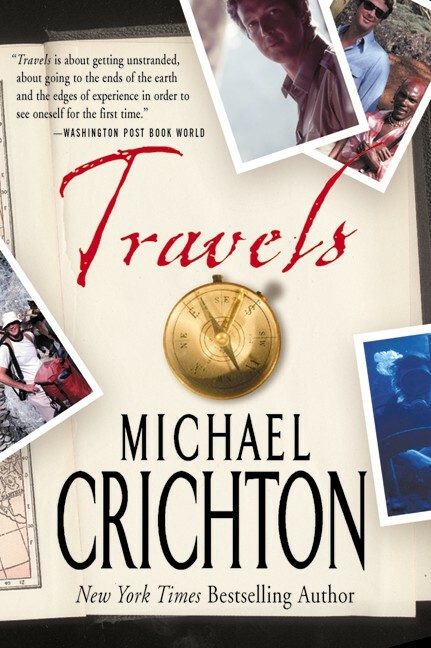 Michael Crichton is an author renowned for his tech-thriller novels, but in Travels, Crichton takes a break from the thriller circuit, dons a travel writer's cap and writes about his journeys instead. His reason for doing so is because "writing is how you make the experience your own, how you explore what it means to you." The book is also Crichton's journey within, struggling with his fears and limitations, to search for himself. He writes, "Eventually, I realised that many of the most important changes in my life had come about because of my travel experiences." Starting out as a medical student who "resented the fact that our education system seemed to be as much about emotions as about the factual content of what we were learning", we discover that the writer of State of Fear already had, by then, a scientific mind and had little patience for the mystical. This belief has no doubt helped him immensely when writing his novels, because a lot of scientific theory and logic goes into them, adding a kind of pseudo-legitimacy into his otherwise outlandish fiction. But along his travels, which take him from Hollywood to the jungles of Pahang, Crichton slowly realises that knowledge of science is not enough to help him live his life, that there is more beyond "the fringe". And it is this realisation, plus a huge dose of curiosity, that brings him to meet psychics and other such mystics, to engage in spiritual sessions. He starts out a skeptic but is soon forced to accept that there are some things that science cannot explain, therefore becoming a believer. Some of the chapters were published in Esquire and the Conde Nast Traveller and can be read as stand-alone chapters. But by reading them randomly you'll miss the transformation from skeptic to believer that happens from beginning to end. However, there is one drawback to this: Crichton occasionally assumes we don't already know what has gone before and repeats information from previous chapters. Though a non-fiction book, Travels reads like one of Crichton's thrillers--fast-paced and sprinkled throughout with scientific trivia. This pace falters in the end though, when Crichton inserts, as the last chapter, a speech on why he "believed there was validity to certain psychic phenomena." It is a reminder to the scientific community "not to discredit science, but to place the workings of science in a more realistic perspective with regard to unaccepted phenomena." The contents of the speech is a fitting conclusion to the book, but after reading through his travels at what seems like breathless speed, the slow-paced speech was jarring to the overall reading experience and seemed out of place. Michael Crichton is fuelled by an intense curiosity that drives him to understand and discover unknown things. This intensity is channelled through his writing and his experiences serve as an interesting and thought-provoking journey, whether outward or inward.